Someone’s killing London’s wittiest pamphleteers. 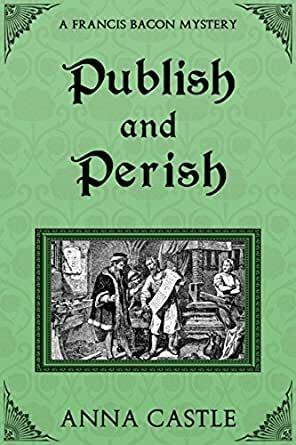 It’s 1589 and England is embroiled in a furious pamphlet war between an impudent Puritan calling himself Martin Marprelate and publishing’s brightest wits. The archbishop wants Martin to hang. The Privy Council wants the tumult to end. But nobody knows who Martin is or where he’s hiding his illegal press. Honorable Mention for Mysteries, Library Journal’s 2017 Indie Book Awards. Buy the fourth adventure in the award-winning Francis Bacon historical mystery series today! Anna Castle writes two historical series: Francis Bacon mysteries and the Professor & Mrs. Moriarty mysteries. She's earned a series of degrees -- BA Classics, MS Computer Science, and PhD Linguistics -- and has had a corresponding series of careers -- waitressing, software engineering, assistant professor, and archivist. Writing fiction combines her lifelong love of stories and learning. Find out more at www.annacastle.com. 2.0 out of 5 starsVERY, VERY DISAPPOINTING!!! I really enjoyed the first two of these Francis Bacon Mysteries. They were fun and historically interesting. I had a hard time putting them down and I read both of them in short order and couldn't wait for the next. I enjoyed the storylines and the characters were well formed and interesting. The third book wasn't nearly as good but I managed to finish it, though not as quickly as the first two. However, this fourth book was, in my opinion, just cobbled together to get something out there. It was boring, tedious and hard to follow. Half way through, I didn't really care anymore. There were too many characters to keep track of and I didn't care about any of them. And, where was Ben?? Perhaps one day I'll finish this one. Unlikely, since, in my old age, I refuse to waste my time any more than necessary. So, I've wasted $4.99. Oh well, lesson learned. A man is publishing pamphlets under the pseudonym of "Martin Marprelate" calling for the reformation of the church in England in 1589. Two men are murdered early in the book and Francis Bacon is tasked with finding the murderers. That is about it. The first 90% of the book is not about finding the murderers but about various people constantly getting together and wondering who Martin Marplate could be. It is no mystery to the reader because the reader is told early on who Martin Marplate really is. Even that person takes place in the seemingly endless discussions concerning who Martin Marplate really is. Oh, and as to the killer, at the end of the book he is asked and admits that he is the killer even though there is no real proof against him. I guess it was time to end this book so that is how it was done. I shall not be reading any more of these Francis Bacon "mysteries". This book is so fun and such a real delight to read. Anna Castle is extremely good at creating lively and yet believable characters. This series has mystery, clever and witty dialogue, lovable characters, a bit of action and lots of intrigue. I look forward to the next Francis Bacon book. Another fabulous entry in the Francis Bacon mystery series. This is the kind of book I really wanted to read slowly, to savor all of the delectable tidbits, but I couldn't put it down! I plan to re-read it just to give myself another chance to enjoy it. The mystery is tantalizing-- and I didn't figure it out-- and the layers of history and detail make it a true pleasure to read. Characters based on persons from history adds depth and interest. This series provides an eye opening view of justice and the limitation of life options depending on ones status and family connections.